Offer your valued customers a convenient and exclusive rewards program or VIP plastic key tag. Our plastic key tags are manufactured from the highest quality materials and printed using state of the art print production methods. Plastic key tags are printed in CMYK/full colour and come with a 5mm hole which is perfect to attach to a key ring. We offer a full barcode printing service which can be added to any plastic key tag. Use the same barcode on all key tags, or incorporate a unique barcode on each key tag. Plastic key tags are a great promotional tool and are also a fantastic way to offer a rewards program to loyal customers. With a plastic key tag, your company contact details and branding will be at your customers fingertips. 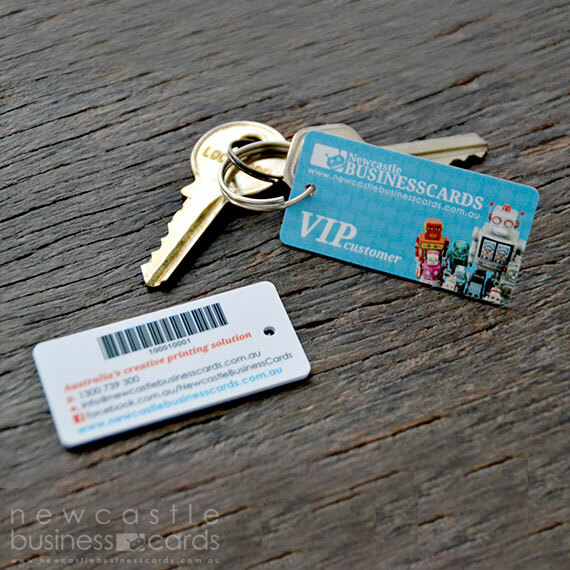 Plastic key tags can be used for a range of different uses including: rewards and loyalty tags, club membership tags, VIP programs, discount cards, loyalty cards and staff ID cards. All plastic key tags come standard with rounded corners and are a sturdy 0.76mm in thickness. Our 0.76mm key tags are the same thickness as the standard credit card (Please note: credit cards containing a chip are 0.84mm thick). If you wish to print colour to the edge of your key tag, please include an extra 3mm of colour (bleed) around the entire artwork. This is where we cut your key tags.